Come along and join Bubba the Bottlenose dolphin as he makes a new buddy while sharing a day they won’t soon forget. Grade 1-2 Reading Level. I have a very vivid imagination that often takes me on wondrous adventures in my dreams. In fact, the idea for my first book, Bubba’s Balloon, came to me in the form of a very funny dream. I woke up laughing and felt that it was a story that must be shared with others. 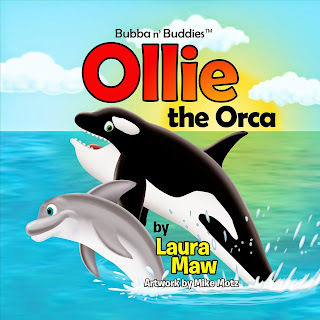 My second book, Ollie the Orca, was later created through daydreaming about what other adventures Bubba might be having. Q2: What was the research process like? Looking at the story with its audience’s needs in mind was the first part of the research process. Children’s books are tough because you have such a wide audience to please, including kids, teachers and parents. Trying to balance the kids’ desire for fun, with the parents’ need for lessons, and the teachers’ need for educational learning was definitely the hardest part of the research process. The second part of the research process was evaluating the words for grade level. When writing a children’s book that can also be read by a child them self it is important to keep a tight grade level range for words. Q3: What is your daily writing schedule? I don’t have a writing schedule of any sort, you can’t force inspiration. As dreaming and daydreaming are a major part of my story creation process, when I write depends on when a great story decides to unveil itself. Q4: If you had to choose, which writer would you consider a mentor? With out a doubt I would have to say Robert Munsch. I loved reading his books when I was a kid! I must have read every one of them. I really liked the humour in his stories and the different imaginative situations that his characters would find themselves in. Q5: Who are your favorite authors? For children’s books these authors are at the very top of my list: Robert Munsch, Stanley and Janice Berenstain, and Theodor Seuss Geisel (aka Dr. Seuss). All four of these authors have something very important in common, they are not afraid of the power of imagination. Outside of children’s book authors, George Orwell is without a doubt my favourite! Nineteen Eighty-Four is my favourite novel of all time! I can’t stop myself from reading it again every few years. I plan on reading Orwell’s entire collection over the course of my life. Q6: What do you like to do when you're not writing? My favourite activity is hiking out to see beautiful lighthouses and ocean scenes. I’ve been to lighthouses in Nova Scotia, Prince Edward Island, and British Columbia. I also enjoy spending time with my horses, Vinni and Jake. Q7: What is your next writing project? I have a story idea for a third Bubba n’ Buddies book that I hope to develop in the near future. There is a new marine character named Sally to introduce!